Second and third year undergraduate optometry students visited the LV Prasad Eye Institute in Hyderabad, India, to learn how its model of care works. 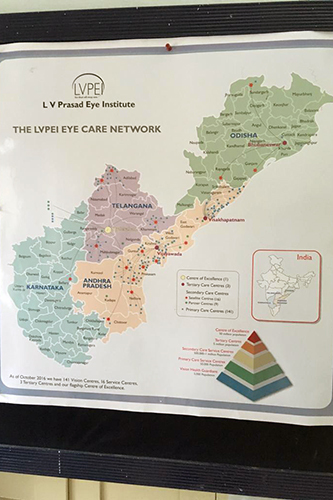 The Division of Optometry and Visual Science at City, University of London has developed a student placement programme with the LV Prasad Eye Institute (LVPEI), which is headquartered at its Centre of Excellence in Hyderabad, India. As part of this programme, second year Optometry BSc students Aamena Adam, Aaron Uraon, Munibah Gangat, and Japneet Sandhu, and third year students Shabnam Raji, Nazneen Patel and Ruhina Hussain visited the LVPEI on two week observational placements during December 2018 (second year students) and January 2019 (third year students). The students observed a range of clinics at the Institute, experiencing how patients with various problems such as low vision, corneal, retinal problems and cataract are treated. The opportunity of travelling, experiencing the culture and observing the clinical care of patients at LVPEI has been extremely beneficial, not only to my studies and my career, but also my personal skills and development. I would love to visit again! Fellow student, Aaron Uraon, wrote a blog about his experience which has been published on his website. The Hospital Saturday Fund funded four of the placements and will be funding a further four each year for the next two years, meaning that 12 Optometry BSc students from City will be funded to undergo placements at the Institute over a three year period.